First, you can check your current weather state of your location (see pic. 1) and get also infos about wind, cloudiness, pressure, humidity, rain sunrise and sunset. In the map section you get an great overview on a thematic map. Based on OSM (what else? ), you see a nice weather map, precipitation and pressure isolines are displayed. Of course, you can simply navigate with your mouse and zoom with mousewheel (see pic. 2). 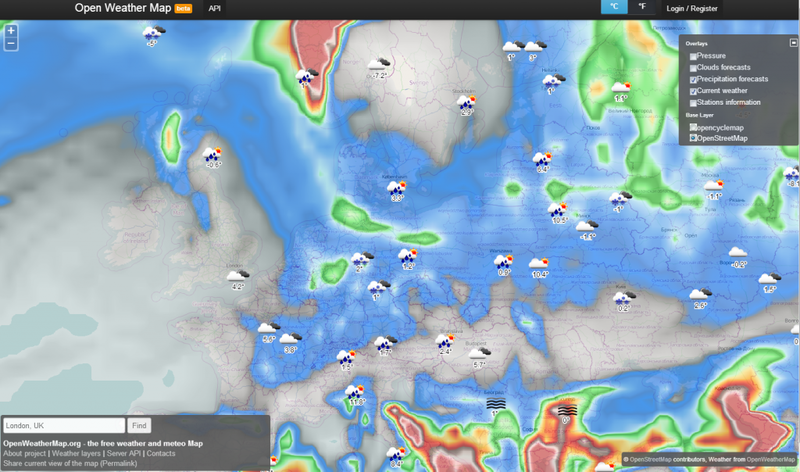 What possibilities has the API of OpenWeatherMap? in JSON or XML. “lang” parameters allow multilingual usage. Besides the official datasets it is possible to deliver your own weather data to OpenWeatherMap. After a short login process, you can connect your weather station and be a part of the active OpenWeatherMap community.